Staying active is the key to a long and healthy life. That’s why we encourage our residents at McDowell Place to plan daily activities they will enjoy or to join in one of the fun programs planned by our activities director. We offer a variety of recreational, educational, social and cultural activities. You can enjoy a muffin and a hot cup of coffee in our Bistro or take a walk with a friend in one of our courtyards. 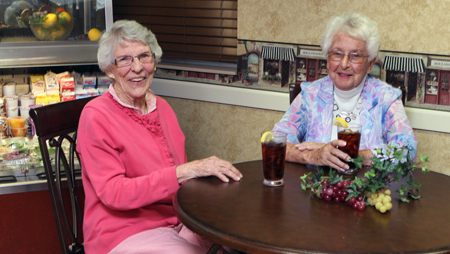 You are welcome to join other residents on regular outings in the community, including programs offered at nearby Centre College. If you are a fitness enthusiast or simply want to exercise indoors, you can take advantage of your free membership at McDowell Wellness Center, which is only a short walk away. It offers individual or group exercise classes, community education programs and a swimming pool. In addition, McDowell Wellness Center offers outpatient rehabilitation, which includes physical, occupational and speech therapies. Our monthly calendar of events.